Mount Ilice, a wonderful side crater on the South-eastern slope of Mount Etna. It’s here that our Calmarossa comes to life. This beautiful mountain overlooks the Ionian Sea and is characterized by an extreme declivity and its fine black sand and volcanic ashes. The soil is rich in minerals that come from the original and primordial depths of our planet, making it the perfect place to grow vines and fruit trees. Here, for entire centuries, many generations of winemakers followed one another, tending and managing these extreme vineyards and working and striving with passion. They were constantly rewarded by Mother Nature with genuine wines, examples of an entirely volcanic terroir. During the last 50 years this ancient pre-phylloxera vineyard, at the altitude of 800 meters above sea level, has been grown with true love and intimate devotion according to a biodynamic regime, by Don Alfio, a passionate and upstanding farmer, a great expert of Mount Etna. We inherited this incredible biodiversity “sanctuary” from him: rare fruit trees and ancient bush-trained local vine varieties that we want to bring back to their original splendour, in order to preserve them and pass them on to future generations. Our Calmarossa has been forged by centuries of ancient Etnean winemaking tradition: a strong and stubborn wine, elegant at the same time, just like the ancient vines from which it comes from. 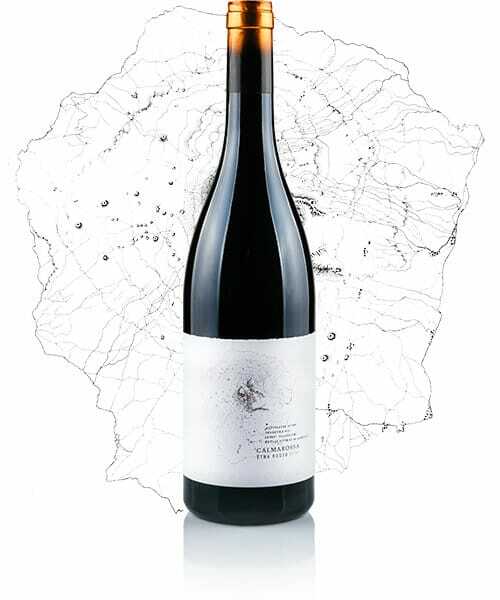 A volcanic wine, with a ruby red colour, which makes one think about the lava itself, about its intensity and fierceness – but that, thanks to its Etnean aroma, can bring peace and soothe one’s soul at every sip. Just as when you get to see a wonderful sunset from peak of the volcano, watching the sea where the mountain rises up or the pure white snow that covers it during winter. An evocative wine, which narrates our tradition and has the very same scent of Mount Etna. Vine varieties: an ancient wine with a pre-phylloxera core, composed by 85% of Nerello Mascalese and 15% of Nerello Cappuccio – which is currently undergoing a process of careful restoration. There are various Etnean native varieties in the vineyard: many of them are very rare, others have not been identified yet. Their grapes, however, are not used in the vinification process of Calmarossa. Area of production: South-eastern slope of Mount Etna, 800 meters above the sea level. Vineyard characteristics: the soil is composed of black sand and volcanic ashes, it’s rich in minerals and presents an extreme declivity which, at some points, goes beyond 40%. The vineyard is grown with ancient bush-trained vines according to the Etnean tradition, with approximately 7-8000 plants per hectare. Climate: dry and windy in summer, with sporadic heat waves. Significant rainfalls in winter and spring, with strong temperature fluctuations from day to night over the course of the year. From June onwards, the Contrada is subjected to a strong dryness. This is countered by the deep root system of its ancient vines, which plunge into the volcanic sand in search of water and minerals. Grape harvest: strictly hand-made as the tradition dictates and performed in the first half of October. The grapes are harvested in 18 kg crates and brought to the wine cellar right after the harvest. Vinification notes:the vinification process is delicate and not at all invasive, in order to preserve the characteristics of the bunch and the signature nuances of the vintage, allowing to make a genuine wine, as the Etnean winemaking tradition dictates. At the end of the harvest, the crates are emptied into the destemmer-crusher. The rasps are extracted from the crusher and later used as a fertilizer. The remaining part, composed by skins and must, is poured into the stainless steel fermentation vessels. When they are full, the indigenous yeast is added and the temperature is brought to 26 °C, keeping it steady through the entire maceration process. The fermentation is monitored daily. With the same frequency, the wine is pumped over the marc cap. After three weeks of fermentation and maceration, the devatting takes places; after that, the wine is separated from the marc. The wine is poured into another vessel, while the marc is transferred through a single pump into the press and later conveyed into the distillery. A few days later the red wine is decanted, separated from the lees and poured into another vessel, so it can go through the malolactic fermentation at a controlled temperature of 18 °C. During this phase, the malic acid turns (thanks to the work of the malolactic bacteria) into lactic acid and carbon dioxide, reducing the overall acidity of the wine and making its taste more delicate. At the end of the malolactic fermentation, the wine is separated again from the lees and decanted in barrels of French oak, where it ages for at least 9 months. After the ageing process in wooden barrels, the wine is decanted in steel vessels, filtered, stabilized and finally bottled. Then the wine has to go through another ageing phase, which should last at least 6 months. Now it’s finally ready and can be tasted by its connoisseurs! which harmoniously blends with a refined tannin. Persistent, balanced and with a rich and enveloping final note. A glass of true Etnean explosion! Alcohol content: 13.5%-14.5%, depending on the vintage. Food pairing: Calmarossa is perfect when served with red meat and seasoned cheese. Other interesting pairings, even if more unusual, are oysters, sashimi, fried fish and Catalan style king crab. Great when served with pasta with sardines and tomatoes, or roasted octopus on a chickling pea bed. We suggest serving it at a temperature of 16-18 °C. When paired with raw fish, the ideal serving temperature is 12-14 °C. Produced bottles: niche production – very few bottles, in a 0,75 l format. Every bottle is accurately numbered. Ageing capability: approximately 20 years, depending on the vintage. First harvest: handmade micro-vinifications early as 1980.